Should Philip Morris Be Able to Sue Governments That Try to Curb Smoking? If the Trans-Pacific Partnership passes, multinational corporations could sue governments that try to protect the health and safety of their citizens. Last week, Wikileaks released the “Investment Chapter” of the Trans-Pacific Partnership and what it revealed was scary and surprising. The leak revealed plans to create a supranational tribunal where foreign corporations can sue governments for “expected future profits.” We already know the consequences of these tribunals. In 2012, a Swedish company sued Germany for phasing out nuclear power, and the cigarette manufacturer Philip Morris is currently suing Uruguay and Australia for laws that aim to curb smoking. Experts like Senator Elizabeth Warren fear that the tribunals included in the TPP would make these kinds of lawsuits even more common—allowing multinational corporations to stand in the way of governments looking to protect the environment or the health and safety of their citizens. In the meantime, President Obama wants Congress to grant him fast track authority for the TPP. That means that he would sign the trade deal without holding a vote and then railroad the deal through Congress in only ninety days with limited debate and no amendments allowed. Activists believe that our best bet right now to stop the TPP is to convince members of the House of Representatives. 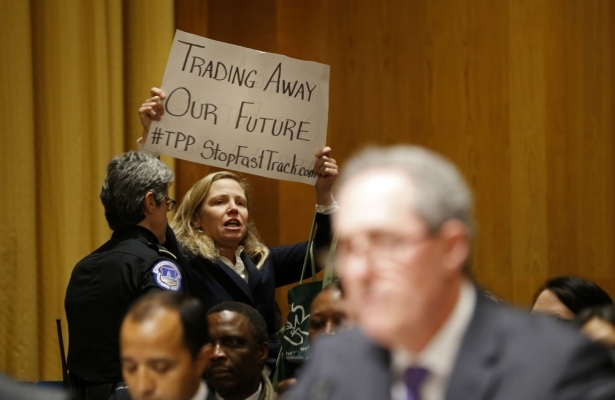 Write to your representative now and demand they say ‘no’ to fast track for the Trans-Pacific Partnership. President Obama has said he needs to pass the TPP so that “we” write the rules for trade with Asia. In her column in the Washington Post, Nation editor Katrina vanden Heuvel points out that currently, “we,” the American people, are not writing the trade agreement. Shadowy corporate interests are writing it. From pushing up drug costs to harming the environment to undermining labor protections, this video breaks down the danger of passing "the dirtiest deal you've never heard of."